We'd a lovely, reflective walk this afternoon: a "Dock Walk" around Titanic Quarter with Chris Bennett and friends. At the end, Chris handed out a prayer - his prayer for the new year. It's published on his blog, but I cheekily reproduce it here as it has much to offer as we all step into the next 12 months of life. I particularly like the idea (and phrasing) of "work to do which has real value, without which the world would be the poorer". That's a challenge and a half. Happy New Year. May it be positive and peace-filled year I which you both experience and share warmth in the communities in which you work, rest and play. Airlines operating in the UK are heavily regulated and their operations are governed by thousands of rules and regulations set by the CAA, Home Office, and other agencies. However, not all of the terms and conditions experienced by air passengers - at least not all of the ways they are implemented - can be traced back to legal requirements. Ryanair insist that you show your passport at check-in or when boarding the plane, even for domestic flights within a country. It's for their convenience that they choose to make this a mandatory part of air travel. Other airlines - budget and ... non-budget - allow other forms of identification, many even tolerating photographic id from national businesses (ie, professional looking work passes). They're trying to confirm that the person travelling is the person named on the boarding card. It's not fool-proof, but it stops someone buying lots of cheap fares and then selling them on to other people for a profit ... and leaving the airline with little idea of who is sitting on-board if there is an emergency. Bigger and more-traditional carriers like bmi - who tend to charge more - are much less vulnerable to ticket touts, and can be more confident that the name of the person on the ticket is the person who has turned up. None of these schemes offers absolute security ... even having to quote the passport number in advance just means that your forged passport matches your booking (rather than being checked against any kind of worldwide database of valid passports). I'm a big fan of the Community Telegraph but I notice that this week's North Down edition carries a bit of a non-story on its website. Concerns have been raised about security at George Best Belfast City Airport after a passenger boarded a flight to London without once being asked for ID. The man — who did not wish to be identified — says he was surprised to pass through the airport’s security points and departure gate without being asked to display identification. It's no surprise that he wasn't asked for identification - other than his boarding card - at any point, since it's not bmi policy to ask. Hardly a lapse or a "lapse". In the hundreds of bmi flights I've made over the years back and forwards to Heathrow, I've never been asked. When contacted by the Community Telegraph, a spokesman for George Best Belfast City Airport said this was an issue for the airline. Calls for tougher security at Belfast harbour after ‘lapse’? 2010 was the year I got to meet Oscar the Grouch (and puppeteer Caroll Spinney) along with his new friends at the local Sesame Tree. After their community open days, I returned to Belfast City Airport to look behind the scenes at how the airport operates. It was also the year our church celebrated its 130th anniversary and hosted the premiere of Dan Gordon's play The Boat Factory about the East Belfast shipyard. He came back in December to stage an Ulster Scots Nativity. Architecture got a look in, with the major public art installation on Broadway Roundabout "Rise" (locally referred to as "Balls on the Falls"), European Heritage Open Days and Prof Ruth Morrow's inaugural lecture at QUB. Belfast Culture Night was a great success along with Moochin Photoman's TTV (Through the Viewfinder) exhibition and giveaway in the Waterfront. Most of the Ulster Museum Treasure Hunt produced for this year's PCI Tech Camp is still valid. And let's not forget Budgie Butlins! The blog followed the review of Belfast library provision that resulted in some closures - more have now been announced outside Belfast. Politically, back at the beginning of the year, the Lock Keeper's Cottage, Castlereagh council and the Robinson family dominated headlines in the mainstream media as well as blogs. It was also a full year of local party conferences - Alliance, a trip down the Sinn Fein's Ard Fheis in Dublin, SDLP (twice), DUP and UUP. Both the SDLP and UUP elected new leaders - I interviewed both Tom Elliott and Basil McCrea in the run up to the vote. 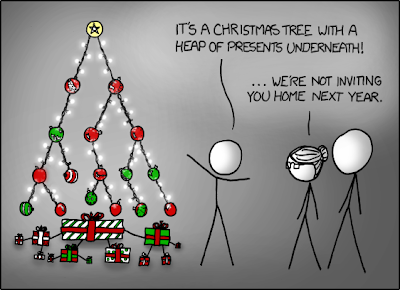 Whenever geeks and nerds (fully) inherit the earth, everyone will get the joke in the xkcb.com cartoon below! 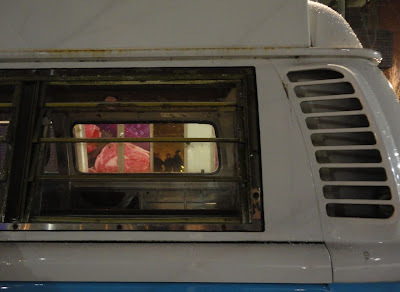 Until then, a very Merry Christmas and a warm and peaceful New Year to all readers of the blog. 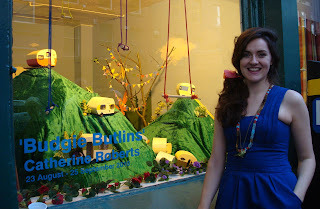 It's been quiet on the blog recently. The cold weather, frozen pipes, frozen water tanks and being busy in work has reducing time for blog posts. I've become a dab hand balancing on top of a ladder with a hairdryer to get drain pipes back working - it's a pain to have water sitting in the bottom of the bath and sink even when the plugs are out! Which all means that I still hate DIY and plan to hang up my ladders and put my orange bucket away in the new year. Plumbing software in bad enough without having to cope with real pipes and water. After a funny but quite traditional nativity play last Saturday, Youtube delivers the Digital Nativity. The Dock should be pleased with last night's turnout. People working in (and for) Titanic Quarter, along with residents and friends gathered inside an unoccupied shop unit at the base of the new apartments in Abercorn Basin. 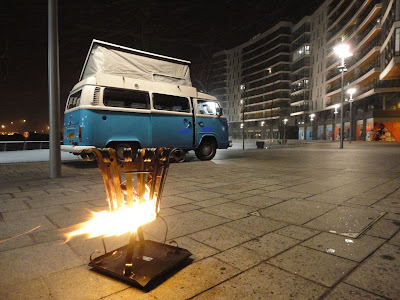 It was easy to find - the open door with the VW blue camper parked outside and a brazier offering heat to anyone needing a smoke. 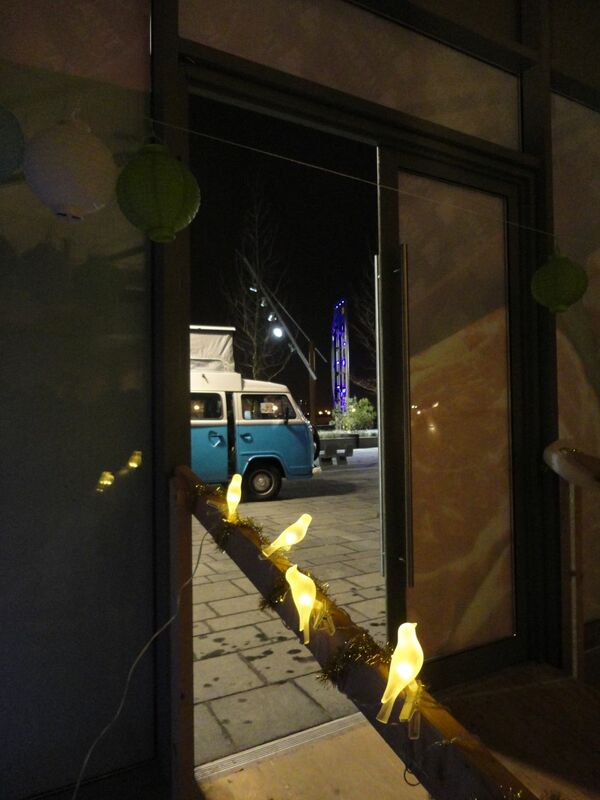 The unit's concrete shell was decorated with fairy lights. 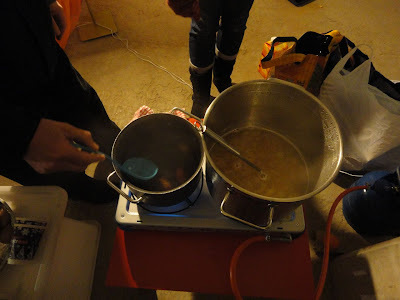 Mulled wines were stewing on a gas stove, along with supplies of shortbread and good cheer. Residents met for the first time. TQ employees explained what excites them about the area. And once again, food (and drink) was a door to relationship. I caught up with Titanic Quarter's chaplain Chris Bennett and asked him about the Dock and his work in the area ... just as it started to snow again. That's the Kit sculpture lit up behind him. For another 36 hours or so you can still catch his thoughtful (and more boisterous than normal!) Morning Worship for Advent from Radio Ulster last Sunday in which he describes a bit more about the project. And this morning's Thought for the Day with Michelle Marken talked about her Dock Walk. Update - You can catch Chris' summary of the evening and his video/slide show over on The Dock blog. The vision for The Dock is simply this: to be the Chaplaincy sofa. To be the hub where the community meets the ministry of the churches, in an informal, inclusive, but intentionally spiritual setting. The informal faith community regularly meets up on a Sunday afternoon, grabs a takeaway coffee at the Odyssey (to keep their hands warm!) 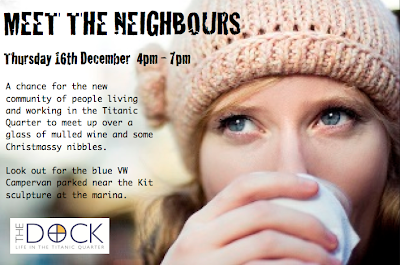 and walks around the Titanic Quarter area reflecting, praying and talking to people they meet. There's a growing community of people building, working, living and visiting TQ. This afternoon between 4pm and 7pm, if you're in the area, you'll find Chris and Harvey the VW campervan parked near the Kit sculpture (at the base of the apartments out behind the Odyssey Arena), handing out "steaming mugs of mulled wine (tipsy and non-tipsy versions)" and nibbles alongside his “deckchair cafe” in one of the shop units at the Abercorn basin. While (Rev) Chris Bennett has a Church of Ireland background, the Dock is deliberately non-denominational. Shared Future is not just a politically-correct buzzword. As we’ve talked over coffee I’ve come to understand just how deeply it is the longing and desire of so many people in this nation – to move on from decades of division and sectarianism, a time when Northern Ireland was world-famous only for violence, to build a future we truly can share and be proud of. And so in the Titanic Quarter, this neutral ground – which one person described to me as ‘the best blank page the church has had in Ireland since St Patrick stepped off the boat’ – it’s our challenge and a core value of the Dock to find out what it means to share the ministry in this place." 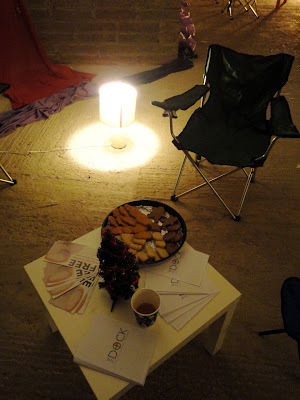 Ultimately, the Dock have a vision of creating a chaplaincy space within a boat moored in the area. Ulster Scots certainly describes the distinctive vocabulary and accent I remember as a child being spoken in County Antrim farm houses by some of my older relatives. I mostly encountered Ulster Scots orally. And while I know from acquaintances who spend a lot of their time working in the field of indigenous minority languages that there is some literature and written material, most people encounter the language through the spoken or sung wurd. It's makes perfect cultural sense when the Thompson Brothers sing old gospel songs as brother duets using the Hamely Tongue or Ullans - Ulster Scots is sometimes known. In the wider cultural scene, there's perhaps a delicate balance to be struck between being celebrating a distinct culture and just being folksy. Why is "The Ulster-Scot" [monthly] paper (possibly distributed with Saturday's Newsletter) completely devoid of anything actually written in Ulster-Scots? 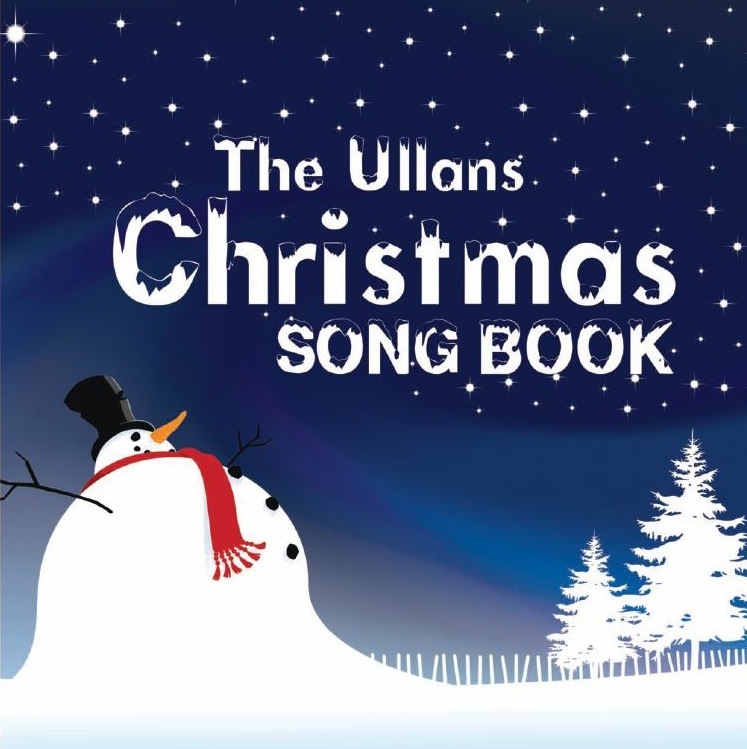 Even more bizarre is the promotion of Ulster Scots through the translation of well known songs and stories into the language. Material which seemingly has absolutely no connection with the culture. Humpty Dumpty? Rudolph the red-nosed reindeer? Yes I know I enjoy Russian and French novels translated into English, but in the early stages of language redevelopment and promotion surely there's better material to use than translating nursery rhymes and Christmas carols from English to Ulster Scots? Many of the rhymes and carols aren't originally English. But over hundreds of years they've been incorporated into the wider indigenous catalogue of material. It seems a bit soon to be teaching I saw Mummy kissing Santa Claus to kids whenever there must be existing content well connected with the cultural place and context with which to kick start Ulster Scots outreach? In baelow the mistletoe las nicht. Shae thocht that A wus happt up in mae bedroom, soun asleep. 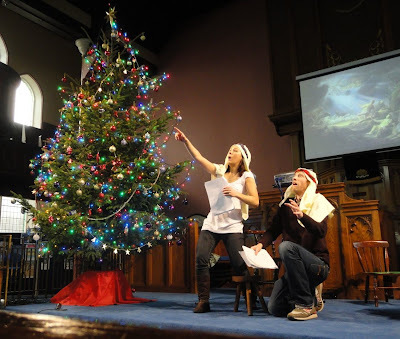 2011 update - the nativity play is back in Westbourne Presbyterian on Tuesday 13 December at 7pm. See post for details about tickets. Saturday - Updated with a shot from the first performance. It was a great wee nativity play, with lots of interaction with the young audience, and lots of parts for the children to play on stage. Hopefully it'll get a larger audience in future years. Kudos to Laura Hughes who steered the show and the children through their paces - and dealt so well with the lamb that appeared in the manger - as well as Roisin Gallagher and Faolán Morgan who played Mary and Joseph. That’s the name of the nativity play (suitable for children and adults) that’s being performed in Westbourne Community Church in East Belfast on Saturday 11 December. 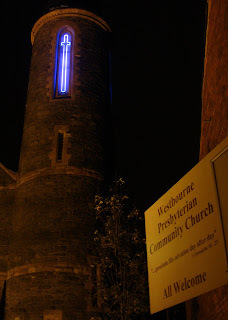 It’s the church with the neon cross on its tower at the bottom of the Newtownards Road. Unmissable. Having hosted the première of Dan Gordon’s The Boat Factory as part of its 130th anniversary celebrations back in October, the congregation is delighted to be hosting a new version of an old story, also penned by Dan Gordon and supported by the Ulster Scots Agency (though the language isn’t expected to be too thick fur tae weans). Admission is free. Performances run at 10am, 11.30am and 2pm and seats can be simply reserved by 028 9046 0295. And if you’re in the area the next weekend, the annual Carols by Candlelight Community Service is running at 7pm on Sunday 19 December, followed by mince pies, shortbread and mulled wine to warm you up. No need to book - just turn up. 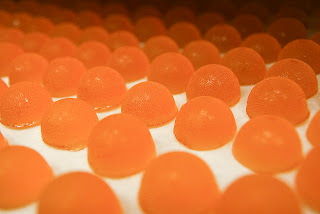 "Like Lib-Dem economic policies, jelly is notoriously difficult to nail to a wall"
A dickie bird at the Treasury tells me the Chancellor of the Exchequer, George Osborne, has become obsessed with eating orange jelly. When this Whitehall civil servant ran into one of Osborne’s unfortunate flunkies recently in the corridors of power, she rolled her eyes and confirmed that, yet again, she had been despatched to stock up on jelly supplies from the canteen. The Chancellor’s much commmented-upon weight gain is thought to be the result of all that late-night pizza he and his Lib-Dem sidekick Danny Alexander, Chief Secretary to the Treasury, have to order in after tortuous budget-cut meetings. It’s thought they have hit upon orange jelly as a low-calorie snack which they may recommend to us all in these difficult economic times. Jelly contains lots of sugar but no protein. It is feared it may make the pair hyperactive. Significantly, orange is the Lib-Dem colour, and the colour of Alexander’s hair. Orange jelly contains Sunset yellow (E110), which is not a good thing. It’s a synthetic yellow azo dye, which must be heat-treated. Found in orange jelly and squash, swiss roll, apricot jam, hot chocolate mix, packet soups and canned fish, it is banned in Norway and Finland but not in Colonsay, the Hebridean island Alexander comes from. John Major used to like jelly and peas when he was Chancellor but, combined with his family’s history in the music hall and the manufacture of garden gnomes, this only made people snigger. Like Lib-Dem economic policies, jelly is notoriously difficult to nail to a wall. 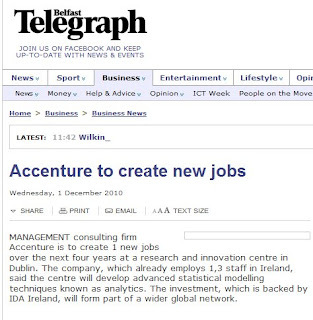 Just the lift the Irish economy needs: "Accenture is to create 1 new job ..."
With all the doom and gloom, today's short article on the Belfast Telegraph website will surely bring a cheer to Irish spirits with the news that Accenture are creating jobs in Dublin. 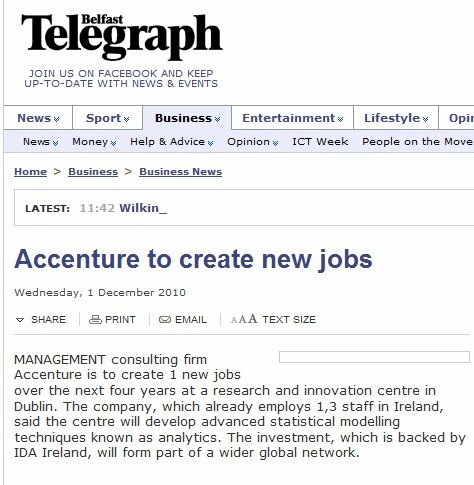 MANAGEMENT consulting firm Accenture is to create 1 new jobs over the next four years at a research and innovation centre in Dublin. The company, which already employs 1,3 staff in Ireland, said the centre will develop advanced statistical modelling techniques known as analytics. The investment, which is backed by IDA Ireland, will form part of a wider global network. The Irish Times have a more believable version: 100 new jobs on top of 1,300 existing ones!